Pirates have many pastimes: collecting treasure, hiding treasure, hunting treasure, and eating. They don't have great table manners, but if you're not repelled by this you may find an interesting competition based on pirates' eating habits: Food Club! Food Club is an older feature on Neopets, as you could probably tell by the art, and it is full of confusing numbers and statistics and math. It is quite a frightening sight. But don't worry. It's not as scary as it looks! Basically, Food Club lets you bet on pirates eating. Therefore, it is a game of chance, and while not every gamble in life pays off, you can make quite a profit from Food Club eventually! 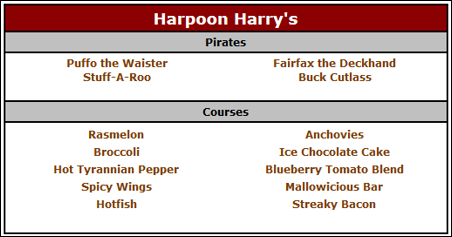 Food Club contains five different eating competitions per day, hosted in different arenas: Shipwreck, Lagoon, Treasure Island, Hidden Cove, and Harpoon Harry's. Four pirates at a time participate in each arena, and each arena contains ten different foods for the pirates to eat. All you really have to do is decide which pirates you think will eat the most, and bet on them! You can place a maximum of ten bets per day, covering many pirates in many arenas if you wish. The older your account is, the more money you can bet and subsequently lose or win: you can see how much you can bet on the place a bet page. Pirates start eating at 1:45 PM NST, and waddle off to take a long nap at 2:15 PM NST; you cannot place bets during this time frame. At 2:15, you can see the results of the previous round, collect your winnings from it, and begin working on your bets for the current round. Your winnings can be stored for up to seven days. After this, you will lose access them and will never be able to get them back, so unless you are aiming to get a trophy, you should collect your winnings every day. With some patience and foresight, making bets that are not crazy can be easily accomplished. It is, however, comprised of many parts and a lot of information. If you like numbers a lot, Food Club is some sort of magical land where ponies prance around and there are sunflowers everywhere. If you prefer words... actually, you'll be okay! And this is why: most of the information you really need contains letters. You don't have to bother with the math if you don't want to. Pirates: This is, as you probably gathered, a list of all twenty pirates that compete in Food Club daily. Clicking on a pirate's name gives you relevant information like his strength, favourite foods, and allergies. His weight and win/loss ratio don't matter to us right now. Courses: All of the foods that the pirates eat is displayed here. Clicking on a food name brings up an image of it and the food types it falls under. If a pirate eats a lot of a food he likes, he'll do a good job, but if he has many allergies in his arena, he'll be in trouble. Next Round: The current round information is here. You can see the pirates and the foods in each arena, and the information from the pirates and courses page is also displayed here. So if the next round page contains all of that information, why do we want to visit the pirates and courses pages? Nobody expects you to memorise all of the pirates, their favourite foods and allergies, and all of the foods. That's silly. Also silly is clicking on each food in an arena one-by-one to find a pirate's favourites and not-so-favourites. Therefore: charts. You can make your own, using a piece of a paper, word processing software, or spreadsheet program like Excel. Or you can just use the already-made charts below. They're basically just lists; one of the pirates and their food information, and the other of the foods and their types. It's all in one place now! Knowing a pirate's favourite food types and allergies is important because it can help determine how well he will do in the current round. This is called a food adjustment. A positive adjustment will help the pirate, and a negative will hinder him. To figure out a pirate's food adjustment, hit up the next round page. Select a pirate to start with, and then cross-check your charts to see how many foods in that arena he likes and how many he doesn't. For example, let's say that this is your setup in Harpoon Harry's. Checking my pirates chart, I see that Fairfax likes vegetables and fruits, but is allergic to salty foods. I can now check my foods chart to see that broccoli, hot Tyrannian pepper, and blueberry tomato blend are all foods he would enjoy eating. The hotfish and anchovies aren't going to go over so well with him, though, as they are salty foods. Mark this information down on a piece of paper: he has three advantages, but two disadvantages. I would write this down as +1 food adjustment, but a tally of 3-2 or some similar system works just as well. Do this for all pirates in all arenas. Then you're ready to visit the Kacheek proprietor. At the place a bet page, you'll be greeted by a blue Kacheek. He tells you how many Neopoints you can place per bet, so you don't have to do the math yourself, and he'll also tell you what the odds for each pirate are. You see, the food adjustments are only one part of the puzzle. They can be considered the change in a pirate's strength - there is an unknown multiplier involved, but generally, a stronger pirate can overcome a poor adjustment better than a weak pirate can do with a positive adjustment. The odds of a pirate will typically match his adjustment pretty well: Fairfax is a middling pirate, on the weaker side, so even with his positive adjustment he's not going to have very good odds. Buck, with a +2 adjustment and high strength, is clearly the best bet. But because you did your work, you know that Fairfax sports a chance, so you might think to yourself, "self, maybe I should place a bet or two on Fairfax just in case". As you're calculating your adjustments, you may wish to pick a pirate or two you like, before you see the odds, and then let those determine which one is worth putting more stake in. Sometimes you'll come across an arena full of pirates with good-to-middling odds. This is a good arena to skip, as the race is tight and not covering all of your bases in it will probably lead to a loss. Instead, put your focus on arenas that contain one or two pirates with decent odds and then two or three poor-odds pirates. A 2:1 in the midst of three 13:1s is the best type of arena. Odds can change throughout the course of the day, due to people betting or not betting on a pirate! A pirate that was initially 3:1 may slip into a 2:1 if lots of people decide he's worth it. Similarly, an 11:1 that not many people are paying attention to may become a 12:1 or 13:1. This is why it's important to calculate the adjustments. The odds are not always the truest approximation of everyone's chances, so you can sometimes predict the upsets and place a bet or two for such scenarios. So once you've decided which pirates you'd like to bet on, it's time to take the plunge! You get ten bets per day, and each bet must be unique. These can cover one arena or five, or any number in between. You can only pick one pirate per arena per bet, but if you decide that two pirates in an arena are worth betting on, you can split them. An important note about betting on multiple pirates in one bet is that all of them have to win. So if Buck and Dan win in that bet, but Gooblah doesn't, that bet fails. It's a good idea, for this reason, to not place all your faith in one pirate for all of your bets. If you've used bets that other people posted for others' use, you might already have an idea of how you'd like to bet. If you haven't, you'll learn by trial and error. Risky bets include more arenas than the average better will use, and often with a pirate or two with middling or high odds. There is a great capacity for a lot of money with these, but they don't have a very good chance of winning. On the flip side, safe betters don't like betting on pirates with high odds at all, preferring to stick to 2:1s and 3:1s. When deciding which odds you prefer to go with, keep in mind that the maximum NP you are able to win on a single bet is 1,000,000. If the bet you want to make exceeds that, you can lower your bet amount from the maximum you are able to bet so you aren't risking more NP than necessary. You may want to write down your bets before you place them to make sure they all line up and that you're happy with the coverage. Once you're ready, tick off the pirates you want and type in the amount you want to bet. Your wager will automatically be multiplied by the odds and your possible winnings displayed. Instead of placing your own bets, you can also follow someone else's! Many players post their own bets for other users to follow - check the games chat or charter for Food Club threads to get some recommendations. At the end of each round, you can check the collect winnings page to see if you won anything. If you didn't, that's okay! Don't get discouraged. Food Club goes through rough patches sometimes, and sometimes you just plain didn't bet on the right pirates. If you stick with it long enough, you can earn quite a lot of money. The bet history page shares this information with you. Your high score is determined by how many Neopoints you collect in a single go. Therefore, if you're aiming for a trophy, you should hold off on collecting your bets right after the round ends: you can hold them for up to seven days before they start disappearing. You should start saving your winnings towards the end of the month, during the last week so you can collect on the first of the next month, when the scores needed for a trophy are lower. Your betting strategy will depend on what you're comfortable with. You may find that betting in a riskier fashion than usual will work nicely, or you might prefer to stick with your normal routine and collect smaller amounts, but more consistently. Always bet the full amount when you're going for a trophy! Sometimes on days when you don't like the odds very much but still want to bet, betting fewer Neopoints helps prevent a huge loss, but you cannot afford to do this during a trophy run. Account age therefore also plays a big part in this, since the older you account is, the more money you can place per bet and then win.